LSU got its first road win over an ACC opponent since North Carolina in the 1985 season. There were only two attempts against current ACC teams since then. LSU lost @ Virginia Tech in 2002 and @ Florida State in 1990. Both games were before the opponent had joined the ACC though. The Tigers have now won 50 consecutive regular-season non-conference games to increase their own record. That 2002 Virginia Tech game I mentioned was the last time LSU lost such a game. In the only regular-season games against ACC opponents since 1985, LSU played Virginia Tech at home (2007) and North Carolina at a neutral site (2010), both wins for the Tigers. There have also been five contests against ACC teams in bowl games over the last 20 years: Clemson (1996 and 2012), Georgia Tech (2000 and 2008), and U. Miami (2005). LSU did play home games against Florida St. and U. Miami at home (before either joined the ACC) in the late ’80s and early ’90s. LSU’s last game against Syracuse had been the 1988 Hall of Fame Bowl (now known as the Outback Bowl), but the Orangemen were independent at the time. 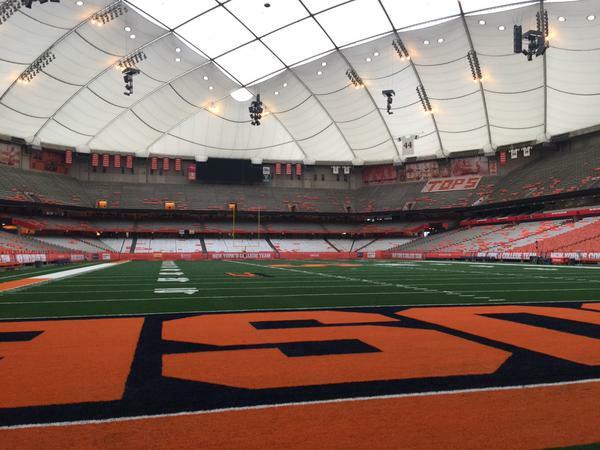 LSU’s only contest against Syracuse before that had been the Sugar Bowl after the 1964 season. 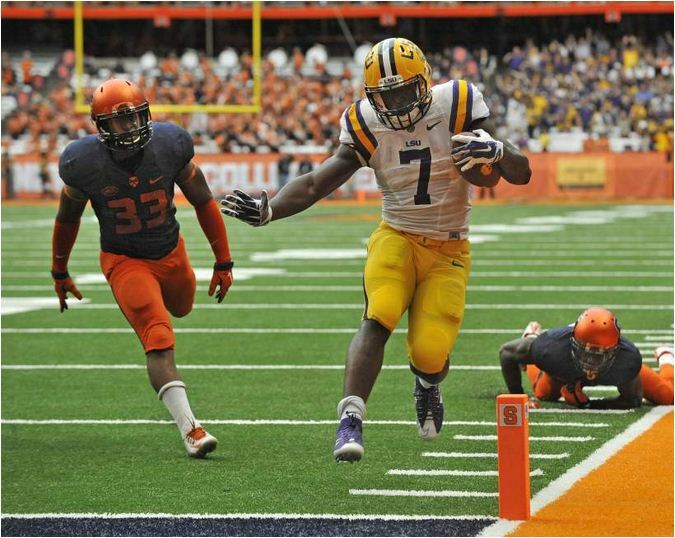 Leonard Fournette runs for the only touchdown of the fist half in the Carrier Dome. LSU only won by 10 points, but that’s not what bothers me. The Tigers could have probably scored a touchdown with just a couple more handoffs at the end of the game. Also, Syracuse only got within 10 by scoring a touchdown in the last two minutes. I don’t think that’s anything to be ashamed of when you’re on the road against a major-conference opponent (especially one who hadn’t lost yet). What bothers me is the way we kept them in the game. Without penalties, this could have been a shutout or close to it. I don’t know if we would have scored more necessarily — we might not have tried to score as much in the second half — but there was definitely one touchdown and possibly a field goal or two that didn’t happen because of penalties. Between two plays — the first one a decent play that was called back by a hold — LSU lost 40 yards of field position. After going out to a 7-0 lead, the Tigers had a third and three at their own 47. Fournette runs to just outside the LSU 30 for an apparent first down. But the tight end is called for a hold. Not saying it wasn’t hold, but I don’t believe it was necessary to allow Fournette to evade the tackle. It would have been at best an attempt at an arm tackle from a weak position. Instead of a first and 10, it’s a third and 14. Harris gets sacked and fumbles (recovered by LSU) at the 27. So it was actually slightly more than 40 yards. Maybe LSU has to settle for a field goal and misses and there isn’t much difference, but that’s still a huge opportunity wasted, not to mention keeping the defense off the field. Syracuse would take over around their own 40, so that’s pretty good field position to set up a field goal try, which was successful. Syracuse should have faced a third and 14 from inside their own 30 before their first touchdown play in the second half, but an LSU player who had lost his helmet helped push the quarterback out of bounds after he was already wrapped up. Personal foul, first and 10 at the 49 instead. The 40-yard touchdown came a couple of plays later. This made the score 17-10 in the third quarter. In the first 40 minutes of play, LSU had already been penalized 8 times for 69 yards. At that point LSU had out-gained the Orange 225-150. That 150 counts the 40-yard Syracuse touchdown I mentioned. Still in the third quarter, LSU gets the ball back up 24-10. Fournette runs for 87 yards to the end zone. If the play stands, the game is essentially over then. But it doesn’t. LSU is flagged again, this time for illegal formation. One of the receivers was a full two yards behind the line and another was about five feet behind the line (some LSU fans contested this, but the angle of the camera made it look like the closer receiver was at the line of scrimmage when he wasn’t). LSU is eventually forced to punt. Two more penalties set up the second Syracuse touchdown as well. The orange earned a first down in LSU territory, but just barely. Then, there was an unnecessary horse collar penalty, and then right afterward an interference penalty. The ball was not catchable, but I guess the contact was so early in the play, that didn’t cancel out the interference. This resulted in a 24-17 score, the last time Syracuse would get within 7. The third touchdown was a result of LSU playing a sort of soft zone/prevent mostly (it was 34-17 with just a few minutes left), but this time there was a complete nonsense penalty. The Syracuse quarterback was running toward the sidelines nowhere near the first-down marker. The LSU defender made contact as the quarterback approached the hash mark along the sidelines; but I guess because he bumped him to get him out of bounds rather than giving him a big hug or raising his arms up like a basketball player, it was a personal foul. Then, as I mentioned, LSU got the ball back and ran out the clock even though they were in possible position for a score. In total, LSU was penalized 14 times for 120 yards. There were another 120 yards or more that were negated by penalties. LSU out-gainted Syracuse 425 to 281, so I wasn’t unhappy about that. Again, could have been a larger margin than that had LSU made it easier for the Syracuse offense to get off the field, but the defense responded pretty well to the pressure it was put under. Syracuse also had really good field position for most of the game. This was partly due to a generaly better kicking game. The Orange had a better night punting than LSU did (5 punts apiece, 228 yards vs. 188 yards), but LSU’s Tre’Davious White ran back a punt for a touchdown, so I guess that helped to even it out. Syracuse had the advantage in kick returns: 176 yards (7 returns) to 57 (3 returns). The good news on offense (other than the obvious) was LSU did not turn the ball over, and Brandon Harris had more passing yards in this game (157) than in the previous two games combined. I mentioned the Tigers got a pretty good amount of yards, but of course Leonard Fournette contributed a good bit to that with 244 rushing yards. Alley Broussard still holds the LSU record (at 250), but it was put in danger for the second game in a row. Fournette does now have the LSU road record and is the first Tiger to rush for over 200 yards in consecutive games. 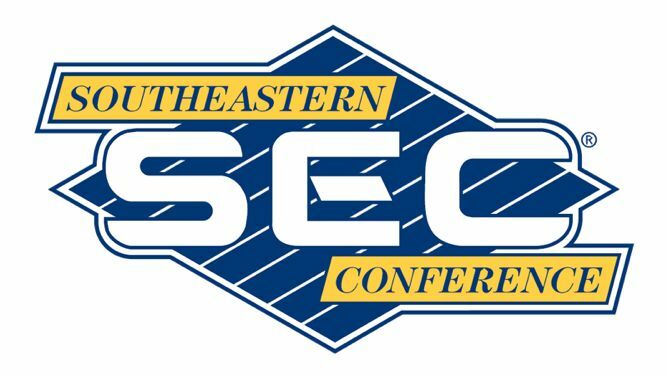 This won’t be the full “SEC Wednesdays” feature I have planned, but I thought I’d start off with comments and predictions of the coming week so I’ll have more to talk about when Wednesday gets here. South Carolina’s season hasn’t been pretty so far, but it’s been better than that of Central Florida, who has lost to both FIU and Furman (as well as Stanford) to start the year. Despite this, the Gamecocks are only favored by 15. Perhaps it was due to the fact that they didn’t win easily in their only win, only scoring 17 in that contest with a maximum output of 22 points in the loss to Kentucky. Still, I think this is by far the worst opponent the Gamecocks have faced and expect them to win something like 31-10. This is also a tough one. 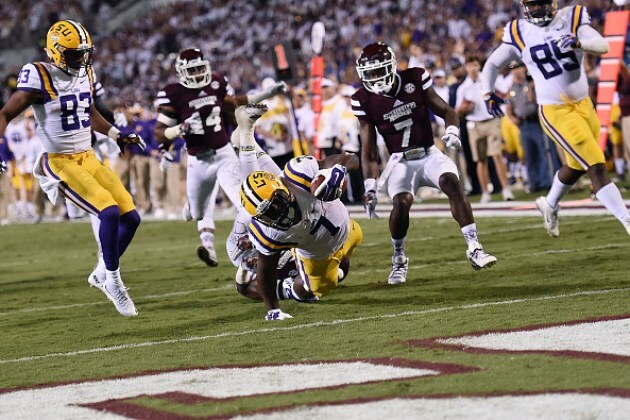 Not that I think LSU will be sweating out the fourth quarter like they did in the game in Starkville, but 24 points is a large spread to expect a road team to beat, especially when it will be 11 a.m. Central at kickoff. But these uniforms hurt my eyes already. Imagine how much worse they’ll be when I’m just waking up. Even the 2007 LSU team that won the BCS championship struggled at Tulane early, and that was a short trip with a relatively friendly crowd. Also, Tulane was a losing team of the CUSA that year. Syracuse isn’t guaranteed a bowl berth out of the ACC this year, but I still think we can assume they’re a good bit better than Tulane was in 2007. LSU still eventually won that game 34-9, but the Tigers were more pass-oriented with Matt Flynn under center (he threw for 258 despite the slow start). I’d expect something similar to score I picked for South Carolina above even if things go well, so I would take the points. I could be wrong though. I would have taken the points for the Auburn game as well. I don’t think it’s even worth discussing whether Georgia will beat Southern or Alabama will beat ULM (despite what happened in 2007). I don’t have a line for Georgia, but I know Alabama is favored by 38. The Warhawks lost to Georgia by “only” 37, so I’m not sure I see Alabama beating ULM by 38. I’d take the points. I usually lean against favored road teams. The line is only 1.5 though, so it’s essentially a pick ’em. The Gators did a good job to win by 5 at Kentucky, but I have to guess Tennessee would have won by more than that given the Vols defeat of Bowling Green by 29. Florida also didn’t play great at home against East Carolina, winning by only 7. Texas A&M is favored by 7.5 on a neutral field against Arkansas. Arky kept it close last year, but I’m not seeing the same fight they had last season. A&M has done significantly better, including comfortably beating Arizona St. on another neutral field. I would take the Aggies minus the points. Vandy has done well in this series in recent years, but I don’t see them doing so well against this Ole Miss team on the road. I don’t know that Vandy is much better than the Fresno St. team the Rebels beat by 52, so I’d take Ole Miss minus the 25. LSU just beat both of these teams, and obviously the Bulldogs did better against the Fighting Tigers, but maybe the location (and it being LSU’s first game) had something to do with it. This is a very good line. I would pick Auburn by 3. That puts them just over the line of 2.5. The Wildcats are favored in this one. Might have something to do with the Tigers’ underwhelming performances against Arkansas St. and Connecticut, but after the last couple of years I’m not underestimating Missouri in conference play. As I mentioned, Florida won by five in Lexington, and I don’t see the Gators knocking it out of the ballpark against the likes of East Carolina. I’ll take Mizzou and the points. I also think they’re the more likely victor even though they haven’t beaten the Wildcats for 29 straight years like the Gators have. I am not really an expert at Twitter and as you might guess, I’m not a huge fan of the character limit. If you want to read my tweets, my handle (I also don’t like the whole nomenclature of Twitter) is @TheBayouBlogger. Low is probably my favorite writer for ESPN. He’s certainly better than anyone they typically put on TV to cover college football. I decided to do my first preliminary computer rankings now that most teams have actually played someone in the FBS who in turn played other teams who have played FBS opponents and it’s possible to get a computer rating on everyone. Before I reveal more, a couple of disclaimers: I don’t start using a full or almost full computerized system until early October, so my official rankings are still the ones that were posted on Sunday; but I thought it would be interesting to see how the teams shaped up at this point. I like to try to get a smooth transition from subjective to objective. Usually I will still move a couple of teams for the first or second top 25 list (although the ratings on my ratings site are always 100% objective). The transition is not always easy. I got someone mad at me when my attempted transition backfired with Missouri in 2013. I kept thinking the Tigers would lose (and I also thought the added points they got for beating Vanderbilt would go away, but Vandy had one of their best seasons in recent memory instead), so I kept them down around #20. Then the weekend where I fully moved to the computer rankings, they got another big win (this time over previously unbeaten Georgia, who had already defeated four P5 opponents in the first five weeks) and shot up to #2. So the transition process involves some guessing and gambling, but I still think it’s better than going from 100% subjective to 100% objective in one week. This was really surprising to me since they usually don’t align early on, but the prelimary #1 is Ohio St., the same as my subjective #1. The prelimary 24th and 25th teams are BYU and U. Miami, the last two teams in my subjective top 25 (but in different order). So to that extent I’m encouraged with my attempts at objectivity. There many discrepancies in the middle of the two rankings though. One example is Florida St., who is 11th in my rankings but is tied with Arizona, Clemson, and Houston for 48th in my computer system. This is because although the Seminoles have beaten three FBS opponents, none of THOSE have beaten an FBS opponent. Boston College did beat a couple of FCS teams, and that would normally result in FSU getting points by extension, but it doesn’t because those FCS teams haven’t beaten ANYONE in FBS or FCS. In the next month, the Eagles will play Northern Illinois, Duke, and Clemson, so they may turn out to be a strong win for FSU in the near future; they just aren’t now. For its part, FSU only plays Wake Forest in the next two weeks, so they mostly have to rely on teams they’ve already played to win to pick them up or they may fall out of the top 25 when I move to the purely objective system. Northern Illinois fumbled away a chance at a huge upset in a sloppy game on Saturday, but the Buckeyes still look good on paper. Obviously LSU is higher (they’re 10th the other way) because their Week 1 game was cancelled, but the difference between 2 games and 3 games is statistically much larger than the difference between 12 games and 13 games will be. So right now, I think that’s definitely worth considering. Also, just to note, you have to go down five decimal places to separate tOSU and LSU under the average-week calculation. Almost every other pair of consecutive teams is separated in the second or third decimal place. West Virginia is sort of a statistical fluke at the moment. That’s the short version anyway. They beat Georgia Southern, who beat Western Michigan. I don’t think Ga. Southern or Western Michigan are good teams, but the former looks like a good win for WVU right now. Western Michigan is the only FBS opponent the Eagles (that’s Ga. Southern’s mascot) have played, and the Broncos played Michigan St., one of the best teams, so they seem to have a really good strength of schedule. I will mostly be discussing the overall score though. I also mentioned in my last rankings blog that looking at this year’s results alone, not factoring in last season or any personal perceptions, Texas A&M should be in the top five, so I’ve confirmed that as well. I’ve laid out several reasons I’m skeptical of the Aggies, but they won’t get a ton of points before playing Alabama in about a month, so their computer rating should come closer to aligning with the subjective ranking anyway. I know I don’t have Notre Dame nearly that high, but as far as my ratings know, the Irish beat Virginia by 70 instead of 7, so that’s one reason I have them a good bit lower. Maybe they’re even better with their third QB in just a handful of games going back to the end of last regular season. Sort of like Ohio St. was in the playoff in January. Notre Dame-UMass SHOULD be dull, but that Notre Dame-Clemson game in two weeks will be huge in determining who goes where in the first computer ratings. There is a bit of an issue with certain FCS opponents counting for too many points right now, but I’ll discuss that immediately afterward and then add some further comments. Something else worth considering is that wins over unbeaten FCS teams (who have actually beaten a Division I opponent anyway) count for a good bit of points right now. The only teams that show up in the top 25 who are influenced by this are West Virginia (so that’s another reason WVU is so high in the weekly average), Iowa, North Carolina St., Ohio U., and U. Miami. This also helps #26 Baylor. 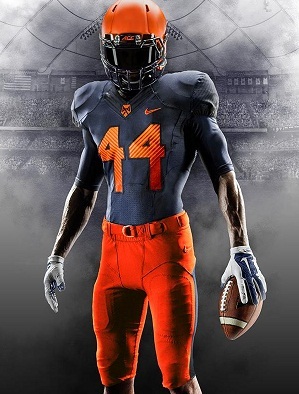 I swear I didn’t rig the system to make LSU’s upcoming opponent (Syracuse) look good this week. Wake Forest is otherwise undefeated, and Central Michigan has a very strong schedule right now having played Oklahoma St. as well. As an aside I found amusing, Les Miles made a point of talking up Central Michigan (and the MAC in general) during his Monday press conference because apparently his wife is a graduate of CMU. After Syracuse, who beat the Chippewas in overtime last week, LSU will play MAC opponent Eastern Michigan, so that may have been a secondary motivation of bringing up the MAC’s success. These things will sort themselves out though. If Wake Forest wins more than a few games, I’ll be surprised, and it’s hard to have a good strength of schedule out of the MAC. This year might be an exception for the MAC though after the way teams like Toledo, Northern Illinois, and Bowling Green have performed against major programs. Just to go down the list though, Oklahoma and TCU are about right. Waiting for TCU to do something though. Oklahoma may go down a bit if Tennessee loses to Florida, so we’ll see about that. The Sooners also have a bye this coming week, so that will allow some teams to pass them up so that should help make it a more natural transition. The Horned Frogs play Texas Tech, which looks good statistically right now due to some early competition. I’m not a believer in Iowa. 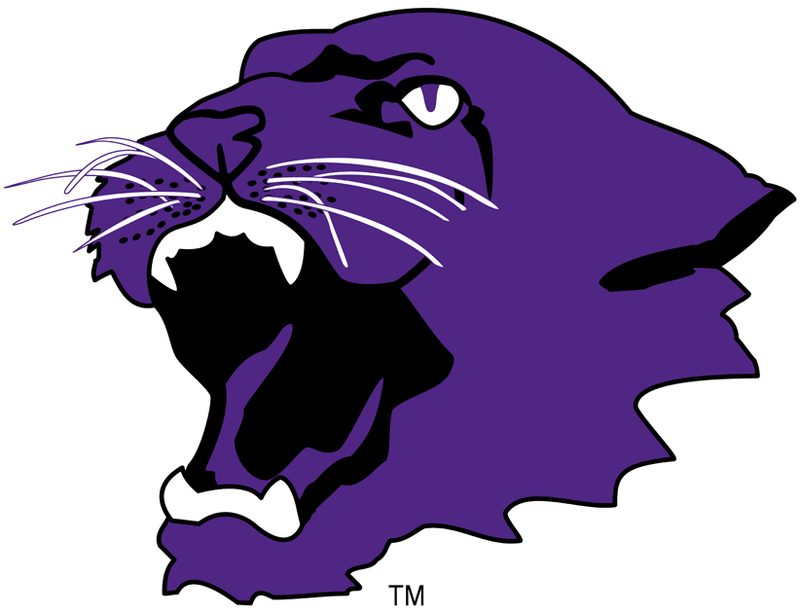 They’re getting a lot of points for their FCS win. Iowa St. probably will never count as a good win this year (likely a very weak one since the Cyclones went winless in the Big XII last season), and Pittsburgh will probably be mediocre. Alabama and LSU are about right, with the proviso I mentioned about the latter having only had two playing weeks. 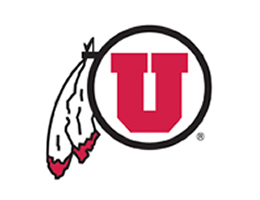 Utah has a good-looking schedule right now, and Michigan helped them out by beating two FBS opponents. 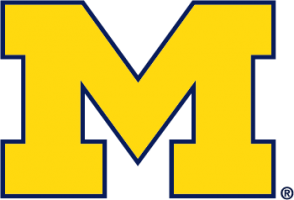 The Wolverines are just out of the top 25 at #29. Indiana is another fluke. The SIU and FIU wins will lose the lustre, I’d expect. Western Kentucky might be all right though. 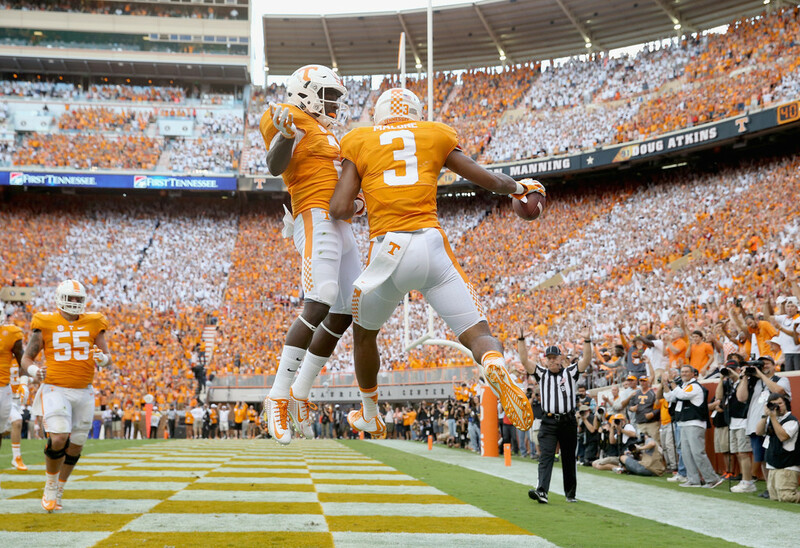 Then we get to Ole Miss. It’s not exactly a secret that the Rebels didn’t play anyone before Alabama. Again, the fact that they won 70-7 or whatever doesn’t matter. Unbeaten Florida knocked off unbeaten Kentucky on Saturday. No guarantee that will mean anything in a couple of weeks, but congrats to the Gators. It’s something to have a 29-game winning streak over another SEC program regardless. Missouri, UCLA, and Temple are other teams who got away with getting close wins, although there is a very small adjustment when you win a close game (≤3) at home. North Carolina St. is another fluke. I don’t think we’ll look back at the end of the season and remark at the greatness of their non-conference wins over Troy and Old Dominion. Same thing with Ohio U.’s wins over Marshall and Idaho. Old Dominion and Marshall may turn out to be all right, but they may lose to a few more teams apiece instead of staying otherwise undefeated. I think it’s fairly clear why Toledo, BYU, and Miami are there. Arkansas does have two losses now, but they got that FBS win and the Hogs’ losses are to two undefeated teams (I mentioned Texas Tech earlier). Nebraska also has two losses from apparently good teams (BYU and U. Miami). Finally, I wanted to announce something. Other than the weekly rankings, this blog hasn’t had too much structure to it. I believe next week I’m going to start a series called “SEC Wednesdays”. This will be a time when I will go into more detail about past and upcoming SEC games rather than having it clog up space in more general blogs. Of course there were a few big games last weekend and I mentioned them already. But after the games this week, I will keep my comments short when it’s an SEC game until the SEC Wednesday blog. The basic structure of the week will be Sundays (starting in October) the new ratings will come out, with the top 25 rankings and discussion blog coming out Monday generally. Then on Thursday or Friday I usually do some kind of preview of the upcoming week for other teams or perhaps I might do something specific to LSU. The last couple of weeks I did “conference reports”. I will probably do that one more time next week before that series will go on hiatus. There aren’t enough inter-conference games to sustain it after the first few playing weeks. I try to do a final one for the regular season before the conference championship games and then another after the bowl games. Alabama, Auburn, College Football, Florida St., LSU, Mississippi St., Ohio St.
I’ll probably do the top 25 tomorrow. Had LSU continued on the road to what should have been an easy win after being up 21-6, I wouldn’t have seen the need for a post-game blog for this game. Not to gloat—far from it after the end of this game—but this was LSU’s 8th win in a row and 12th win in 13 tries in Starkville. For more about the series history, please see the blog I have just updated. As I’ve said all offseason, the defensive problem I worry about is depth on the secondary, not the line. This is what the spring game made loud and clear when both quarterbacks could just throw the ball up against the second team, and it was almost always caught, often by a wide-open receiver. The secondary did all right for most of this game, but as I expected, those cracks showed up in the late third and throughout the fourth quarter. I don’t care how many returning starters there are: when there isn’t much offensive production, all you need is one player in the secondary to be a step or two out of place on a couple of plays to lose the game. Also, De’Runnya Wilson can catch some passes when a defender isn’t out of place at all. Dak Prescott generally didn’t have enough time to get it to a receiver, but I think that’s the difference between Chavis and Haley last year and Steele and Orgeron this year. LSU will face more experienced offensive lines, but despite that, I was still impressed by the combination of sealing the running lanes and creating a pass rush. Unlike a lot of LSU fans, I was skeptical of Brandon Harris all of a sudden being a good quarterback, and I’m still skeptical. He did look better in this game than he did during the spring game against the first-team defense, but this is a defense that only had four returning starters and wasn’t even that great last year. He had a good completion percentage, a couple of good runs, and didn’t throw the ball into danger; but 71 passing yards is a joke. Leonard Fournette reaches for the end zone. Fournette ran for 159 yards on 28 carries. There has to be a credible passing threat on second and third downs to keep the defense off balance. This passing threat also needs to exist with an 8-point lead or a 2-point lead when keeping possession is that much more important. One or two completed passes in each of the last two or three drives could have allowed the Tigers to keep a double-digit until the game ended. The Tigers had their own penalty troubles. LSU had two touchdowns called back (I think one was on an eventual touchdown drive though), and they had another play late in the game that would have given them the ball inside the 20 when instead they failed to score in the final 21 minutes of the game. The Tigers were penalized for 95 yards, but there were another 100 or more yards of plays that were taken off the board. I also think LSU could have gone for it on fourth down late at midfield. They had two chances to do so, once with the ball at the Mississippi St. 43. I don’t think a 25-yard punt (what actually happened) or even a 35-yard punt is better than having a chance at a first down to control the end of the game. LSU had a first and 14 after a hold that called back that play I mentioned that put them inside the 20. I can’t disagree more with responding to the situation with the predictable run, run, pass, punt. Now that I have my griping out of the way, I do want to put this in perspective. It is important to remember that this was LSU’s first game. Mississippi St. had already had an opportunity to screw up the beginning of a game and come back to win last week, and this week was their home opener after a very good season (especially by their standards) last year. So their fans seemed even more enthusiastic than normal. You can have games like this in September though. Ohio St. of course lost to unranked Virginia Tech at home last season. The Hokies were actually 34th in the AP preseason poll, whereas Mississippi St. was ranked going into this game. Florida St. had several games last season that could have been losses but ended up winning its conference undefeated before losing in the playoff. Alabama, another playoff team last year, started out with a shaky game against a West Virginia team that ended up with six losses. It was a 3-point lead at halftime and the Mountainers were within a touchdown until about 8 minutes left in the game. Speaking of which, Auburn comes to town next week. I know they barely beat Jacksonville St., but I have a feeling we didn’t see the best Auburn team in that game. So there will be two teams who know they need to make big improvements or their seasons could unravel in a hurry.